Take a peek into Iowa’s prehistoric past with these “living fossils” that still exist in Iowa today. This fish is older than the dinosaurs – for real. 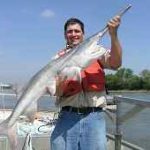 Fossil records show paddlefish have been around for more than 300 million years – that’s about 50 million years before the first dinosaurs appeared. Not only has the species been around a long time, but they’re a long-living group too. Iowa paddlefish commonly live for 20 years, with 30 years or more not all that unusual. Paddlefish are a remnant of ancient life, differing from other fishes by its elongated paddle-like snout, long gill covers and shark-like body form. One of the creepiest looking “living fossils,” the lamprey dates back about 360 million years. 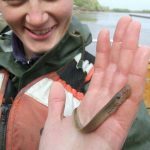 While this native lamprey may seem intimidating, it’ll do no harm to people. It is endangered in Iowa, so if you catch one, release it unharmed immediately. Its mouth acts as a suction cup and it uses its teeth to cut through a fish’s skin and scales. On the Mississippi River, it commonly attaches to paddlefish, common carp, and northern pike. It rarely kills its host. It usually grows to about 12 inches long. While rare to find in Iowa, the pallid sturgeon hasn’t changed much over the course of 70 million years. It is endangered in Iowa, so if you catch one, release it unharmed immediately. 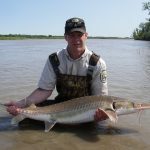 You can tell a pallid sturgeon apart from a lake sturgeon or shovelnose sturgeon by its outer barbels – they’re twice as long as the fish’s inner barbels. Those barbels are U-shaped, with the inner two set out in front. It also has a smooth, not scaled, belly. As a nod to its tenure, the common snapping turtle’s most distinctive feature is its long tail with raised Stegosaurus-like plates projecting along the midline. The snapping turtle is a large turtle with a big head, a long tail and a nasty disposition. It also has a much reduced diamond-shaped plastron (lower shell) that is connected to the carapace (upper shell) with two narrow bands on the sides. The rear marginal scales of the carapace have points that give the shell a jagged appearance. 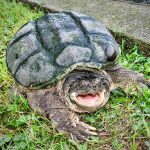 The only other turtle that can be confused with the common snapping turtle is the alligator snapping turtle, but it is larger and limited to the southeastern tip of Iowa in the Mississippi River. Adults usually have shells eight to 15 inches long and weigh up to 40 pounds. The common snapper is part of the Chelydridae family of turtles, which has fossils dating back to the Cretaceous and Paleocene time periods. The next time you watch a dragonfly flutter along the banks of a pond, take note that you’re watching a sight that’s gone on for about 325 million years. While the ancestors of today’s dragonflies were much larger, the family line continues today. Dragonflies serve as indicators of good water quality. 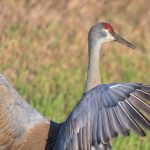 Migrating sandhill cranes may show up in Iowa in April, but their ancestors have been here for quite a while. The oldest sandhill crane fossils date back 2.5 million years. In Iowa, you may be able to spot one in a marsh, wet prairie, lake or fen in the northern part of the state in summer. The sandhill crane lives in prairies and fields. It eats small rodents, frogs, insects, worms, snails, young birds and eggs, seeds, grass shoots, grain (especially corn), bulbs, berries, lichen, and aquatic plants. Its call is a low, loud, musical rattle. Another Iowa migrant, the pelican has been around the block a few times – like for 30 million years. While it doesn’t nest in Iowa, you can see large numbers of them migrating through the state. 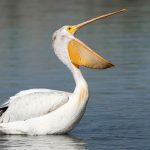 The American white pelican is huge – standing at 62 inches high – and is known for its eating style. This pelican eats crustaceans and fish by scooping them up while paddling on the water. No need for a snail to be in a hurry when you’ve been around for 440 million years. Back then, our snails crawled along a sea floor. While the landscape of Iowa has changed drastically in that time, snails keep on, slow and steady. The Pleistocene snail, a rare snail that lives on cool Iowa slopes in leaf litter, is considered to be a relic from the Ice Age. While not animals, ferns and clubmosses have been around for 300 million years or so. And while they may not be living, fossils exist throughout the state. Check out the Fossil and Prairie Center near Rockford or the Devonian Fossil Gorge in Coralville to search for yourself. Lake Red Rock near Knoxville and Pella is also home to an ancient floodplain – explore the iron-stained cliffs to look for fern and tree fossils from an ancient forest.